Crystal skulls have long had a fringe following, and the most famous of them is one named for the explorer-author Frederick A. Mitchell-Hedges (see "Legend of the Crystal Skulls"). Mitchell-Hedges claimed to have found the skull somewhere in Central America in the 1930s, but his adopted daughter Anna later said she found it under a fallen altar or inside a pyramid at the Maya site of Lubaantún in British Honduras (now Belize) some time in the 1920s. Neither of their contradictory accounts is true. In fact, like all the other crystal skulls thus far examined, it is a modern creation, despite its nearly mythical place in the minds of devotees. I have had two opportunities to examine the Mitchell-Hedges skull closely and to take silicone molds of carved and polished elements of it, which I have analyzed under high-power light and scanning-electron microscopes. I have also evaluated the documentary evidence, newspaper stories about Mitchell-Hedges, his memoirs Land of Wonder and Fear (1931) and Danger My Ally (1954), and a file of letters and documents that Anna Mitchell-Hedges sent to Frederick Dockstader, the director of the Museum of the American Indian in New York City, which I recently found. The microscopic evidence presented here indicates that the skull is not a Maya artifact but was carved with high-speed, modern, diamond-coated lapidary tools. 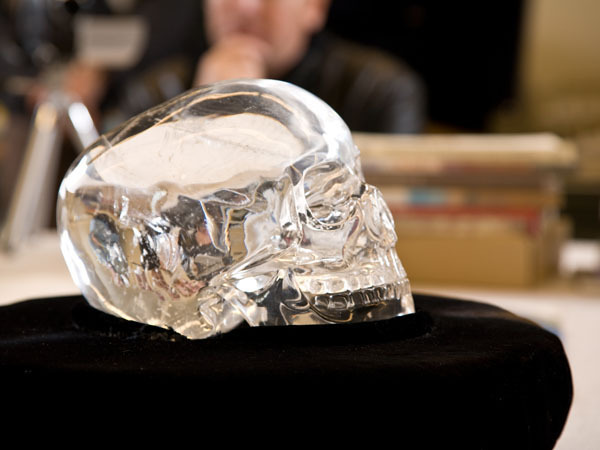 The historical record shows it first appeared in London in 1933 and was purchased a decade later by Mitchell-Hedges, who claimed the crystal skull was an authentic pre-Columbian artifact. The newly found archival evidence suggests Anna was later involved in the evolution of tall tales about the skull's origins, providing a fascinating look at the creation of a popular mythology in service of a profitable business venture. Analysis of the Mitchell-Hedges crystal skull using SEM leaves little doubt that this object was carved and polished using modern, high-speed, diamond-coated, rotary, cutting and polishing tools of minute dimensions. This technology is certainly not pre-Columbian. I believe it is decidedly 20th century. The similarities between the Mitchell-Hedges skull and the British Museum skull suggest that the former is an improved copy of the latter. 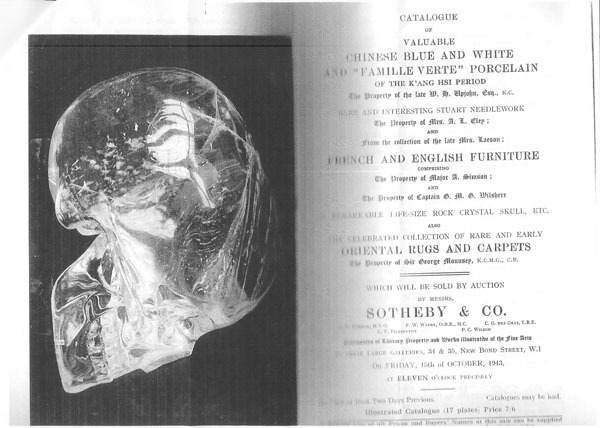 The recently published SEM study of the British Museum skull additionally suggests it was probably carved within a decade of the date it was first offered for sale in 1881 (Sax, Walsh, et al. 2008: p. 2759). It is not unreasonable to conclude that the Mitchell-Hedges skull, which first appeared in 1933, was also created within short time of its debut. Frederick A. Mitchell-Hedges began an association with a California art dealer named Frank Dorland in the 1950s to promote and sell an icon he called the Black Virgin of Kazan, which later turned out to be a copy. Anna Mitchell-Hedges continued this relationship after her father died in 1959, ultimately agreeing to Dorland's proposal to "launch a program about the [crystal] Skull and get your price" (11/25/1963). A number of wildly speculative publications resulted from this promotion. One, Phrenology (1970), suggested the skull had belonged to the Knights Templar and was taken to British Honduras by Mitchell-Hedges. Another, Ambrose Bierce, F.A. Mitchell-Hedges and the Crystal Skull (1973), claimed that Bierce, a journalist who disappeared in Mexico in 1913, and Mitchell-Hedges had stolen the skull when they were both fighting alongside Pancho Villa. 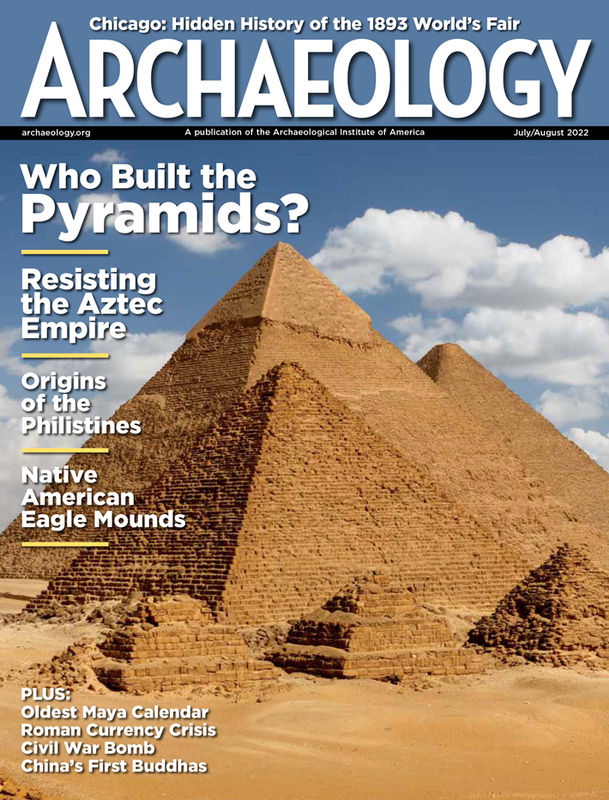 Later, Dorland hired the novelist Richard Garvin to write The Crystal Skull that had Anna Mitchell-Hedges herself discovering the skull inside of a Maya pyramid at Lubanntun. Eventually, I believe that Anna attempted to legitimize this object through its exhibition in a respected museum—the Museum of the American Indian. The correspondence between Frederick Dockstader, director of the Museum of the American Indian, and Anna Mitchell-Hedges clearly demonstrates how the process of legitimizing objects with potential mass appeal but dubious authenticity and provenience works. In their letters, each seemed to flatter the other to achieve their own separate, though similar, ends: to increase visitation to the museum and to enhance the status of the crystal skull. 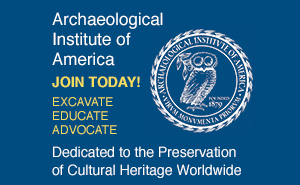 Despite the Museum of the American Indian director's long-held suspicions about the skull, not to mention the warnings from well-meaning colleagues, the Mitchell-Hedges skull was, in fact, exhibited in New York for an extended run. That exhibition endowed the skull with a legitimacy that it had not had previously. Following the exhibition and the publication of the Garvin book in 1973, the Skull of Doom's owner launched her long career as keeper of the ever more mysterious object, whose extraordinary powers, like her father's claims and collections, grew and grew and grew. In Danger My Ally, Frederick Mitchell-Hedges warned that the skull was "the embodiment of all evil" and that "several people who have cynically laughed at it have died, others have been stricken and become seriously ill" (1954: p. 240). Clearly, we should not believe everything we read, and, ultimately, we must be brave and tell the truth. The Mitchell-Hedges crystal skull is not ancient; not even very old. It was probably made in Europe in the 20th century, and was not polished for five generations. It is not powerful, not scary and not at all what it purports to be. Jane MacLaren Walsh is an anthropologist at the Smithsonian Institution's National Museum of Natural History. Using her expertise in Mexican archaeological collections, she is seeking to understand how museum collections are formed, and what artifacts, including fake artifacts, can tell us about the evolution of our knowledge and understanding of other cultures.